Burt Gummer and his son Travis visit a remote research station, where they must go up against Graboids that have been converted into living weapons. Nearly 30 years after the series’ debut, we get a sixth Tremors movie via 2018’s direct-to-video A Cold Day In Hell. When last seen, monster hunter Burt Gummer (Michael Gross) and his son Travis Welker (Jamie Kennedy) ventured to South Africa to fight the deadly creatures we first met in the original flick. After that adventure, Burt and Travis head to Canada to investigate more violent attacks. At a remote research facility, Burt and Travis suspect someone now “weaponizes” Graboids, a development they must combat. Cold Day represents my second foray into the world of Tremors sequels. While I saw the original back in 1990, I skipped the 1996 and 2001 follow-ups – and only checked out 2015’s Bloodlines because I received a review disc. I liked the original a lot, and I thought Bloodlines offered passable entertainment. While not a great film, the fifth entry in the Tremors franchise managed to keep me with it – not a bad feat for a direct-to-video effort in a long-running series. No such praise will greet Cold Day, as it delivers the awful experience I expected from its predecessor. Stupid and annoying, the movie goes nowhere. Whereas Bloodlines veered closer to Jurassic Park than Tremors, Cold Day attempts something more akin to the 1990 film’s mix of comedy and action. Unfortunately, it does neither well. Though the comedy flops worse, as Cold Day’s stabs at humor seem idiotic and resolutely unfunny. We get a bad start when the movie thinks it’s hilarious to refer to a character as “Agent Dickweed”, and the gags don’t improve from there. While superior, the action scenes don’t add a lot of excitement to the package. When Bloodlines entertained, it did so due to surprisingly good battle sequences, but Cold Day fails to match up with its predecessor, as its attacks/fights seem awkward and flat. Cold Day barely attempts a plot, and its characters register as one-dimensional. Most of the roles remain anonymous – you might remember the names of a few, but I doubt it. As for our two returning cast members, Kennedy does okay, but Gross becomes an active annoyance, as he just yells and grimaces his way through the movie. Burt was always a caricature, but now Gross plays him like a spoof of a parody of a joke, and his work turns into a major flaw. Not that Oscar-caliber acting would salvage this stinker. Add mediocre CG effects to the mix and Cold Day damages the Tremors franchise. 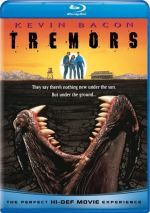 Tremors: A Cold Day In Hell appears in an aspect ratio of approximately 1.78:1 on this Blu-ray Disc. This became a largely appealing presentation. Overall sharpness worked fine, with only a little softness seen in some wider shots. The majority of the film delivered accurate, distinctive imagery, though. The movie lacked jagged edges or moiré effects, and edge haloes remained absent. As expected, no print flaws cropped up along the way. A semi-inevitability, Cold Day went for a palette that focused on orange and teal, with an emphasis on the blue side of the spectrum to match the frozen setting. Though these choices seemed tiresome, the Blu-ray replicated them appropriately. Blacks appeared dark and deep, while shadows seemed smooth and clear. This became a more than satisfactory visual presentation. As for the movie’s DTS-HD MA 5.1 soundtrack, it offered an active affair – probably a little too active, to be honest, as the soundscape felt a bit unbalanced. The surrounds played a strong part in the proceedings to the degree where they occasionally threatened to overwhelm the whole package. This meant the back speakers offered information that threw the mix a little out of whack and didn’t seem as natural as I’d like. Still, the mix wasn’t badly off-kilter, and it provided enough action involvement to be generally positive. Audio quality worked fine, with dialogue that seemed natural and concise. Music appeared full and rich as well. The most dominant aspect of the mix, effects fared nicely, with elements that seemed vivid and dynamic. Low-end response added real kick to the proceedings as well. The mildly unbalanced soundfield caused me to deduct some points, but the track still offered a largely satisfying sonic experience. 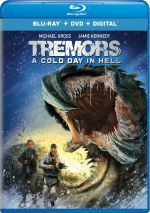 A few featurettes fill out the disc, and these launch with The Making of Tremors: A Cold Day in Hell. A six-chapter program, it fills 14 minutes, six seconds with comments from director Don Michael Paul, costume designer Danielle Knox, producer Mike Elliott, special effects supervisor Paul Pieterse, and actors Michael Gross, Jamie Kennedy, Tonya Van Graan, and Jamie-Lee Money. “Making” examines story/characters, costumes, Paul’s impact on the production, sets and locations, action and effects. A few minor insights emerge, but these clips tend to feel awfully thin and promotional. Anatomy of a Scene lasts four minutes, one second and features Paul, Elliott, Pieterse, 2nd unit director/stunt coordinator Grant Hulley, visual effects on-set supervisor Paul Kalil, and actor Jenna Upton. “Anatomy” looks at one specific attack sequence from early in the film. It delivers some decent shots from the set but like “Making”, it lacks depth. Finally, Inside Chang’s Market takes up two minutes, 47 seconds and delivers comments from Paul and production designer Andrew Orlando. They take us through the set and show some “Easter eggs”. It becomes another mildly interesting piece. The disc opens with ads for Death Race: Beyond Anarchy, and Dead Again in Tombstone. No trailer for Cold Day appears here. A second disc provides a DVD copy of Cold Day. It includes the same extras as the Blu-ray. As the sixth film in the franchise, Tremors: A Cold Day in Hell offers a story that branches out in potentially intriguing ways. Unfortunately, its execution fails miserably, as the movie suffers from a myriad of flaws. The Blu-ray brings very good picture and audio along with a few minor bonus features. Even major Tremors fans should avoid this awful movie.